It seems that many artists unfamiliar with oil pastels want to know how to use them, or at least how to get started. While oil pastel work isn’t quite painting, it isn’t quite drawing either, not in the traditional pencil or pen sense anyway. So in this blog post, I thought I would talk about how I use oil pastels and also go through step by step, some of the different techniques I use to achieve certain results. 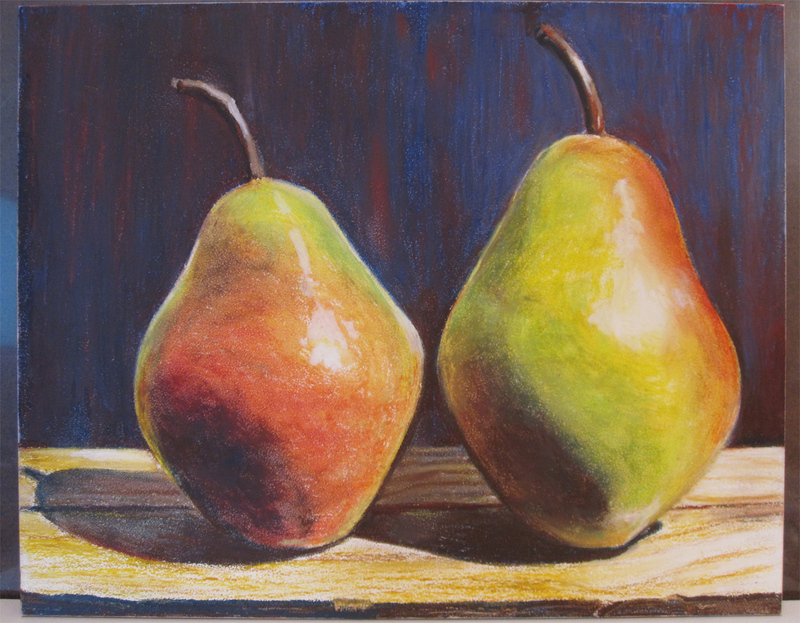 Recently I did an oil pastels drawing of some pears, and I thought it would make a good example to use to talk about how I use oil pastels, generally speaking. Every piece is different, and might require different approaches, but overall, the oil pastel techniques I talk about here can be applied to most oil pastel work. First, I make just a sketchy drawing with some base colors to get a feel for my composition and how the shapes are working out. Next I establish more base colors and get just a light a sense of how the composition is going to look in the end. I know adjustments will be made, but I want to have some idea of what the overall piece is going to look like. In my next step I am adding more colors into the composition – not much blending yet, still somewhat sketchy. Next I worked out my background color. This step took longer than may appear… I had at first a lighter blue which I didn’t feel very good about. I ended up making that blue darker, and then after that I decided to add in the reds and browns. In the next step, I focus on the wood and the shadows cast on the wood. I do some blending but still leave a sketchy feel to the surface. The sketchiness was left in (as opposed to smooth blending) to capture more of the sense of the cut of the wood. It is a bit more blended in on the right side as that is where a strong light source was coming from. In this step I also added in a touch more green and blue to the pear colors. This is the final step. I’ve blended the rest in and touched up some highlights, such as the stem of each pear and along the sides. I also have gone back and restudied from the photo and made some adjustments to values. For example, the highlight along the top of the wood in the center, right between the two pears – if you compare that with the previous photo you’ll see I made it darker. Thanks for reading and following along – any questions or suggestions for me please feel free to ask!